Adjustable clamps let you move each pocket individually. Green-edged pockets present your materials with the same elegance as a glass holder. 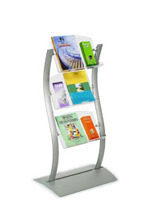 This catalog stand features (3) green-edged, acrylic pockets to present and organize your literature. 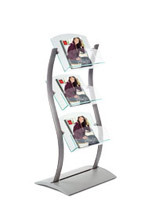 The periodical display, catalog stand is a great addition to any store or office with contemporary décor. 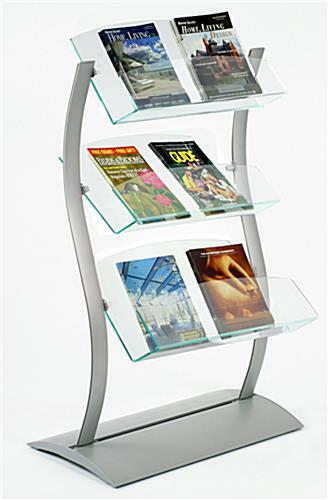 This catalog stand, also known as a literature rack, can be used as both a merchandising and an organizational fixture. A waiting room, for example, would benefit greatly from the addition of this holder. 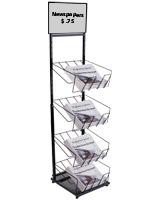 This store fixture, catalog stand will help draw customers into your store. 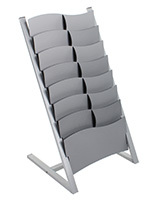 The catalog stand is constructed from brushed aluminum for a sleek yet durable design. The silver finish will blend with any décor, while the aluminum construction will withstand rust and everyday wear from indoor use. 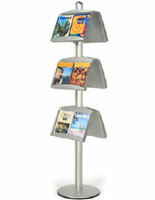 This periodical display is also an adjustable catalog stand! 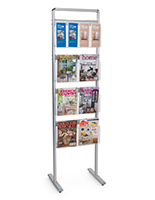 We provide the catalog stand with brackets you can slide up or down each aluminum side support to alter each pocket's height and orientation. 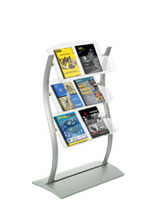 The catalog stand, such as our other wave-shaped displays, has an unusual design to make your publications more noticeable!